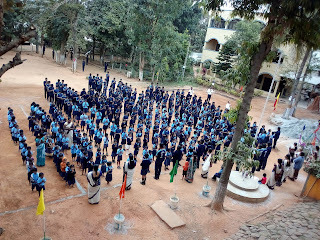 VIVEKANANDA KENDRA VIDYALAYA – KALLUBALU REPORT ON SADHANA DIWAS DAY CELEBRATION Sadhana Diwas was celebrated in VKV Kallubalu on 17 November 2018. 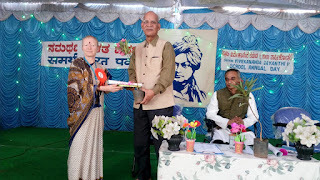 Song and speech on Mananeeya Eknathji by students and teachers were the part of the programme. Su.Sri Usha didi and Shri.Karthikji were the chief guests. 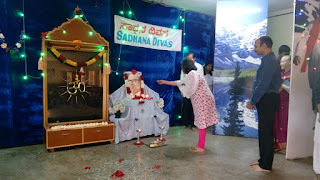 On 17/11/2018 , Saturday Sadhana Divas was celebrated in our vidyalaya. The programme began sharp at 8:30 am. After the National Anthem Kannada song, speech by 8th std student [ Jayaraj], Hindi song, Speech by the teacher [ Nikhil sir ] were conducted. Song by 10th std girls was the final performance. Entire assembly was managed by Ramakrishna House. Su.Sri Usha didi and Shri.Karthikji were the spontaneous chief guests . the programme was conducted with discipline and exhuberant enthusiasm. The vote of thanks was delivered by Nikhil sir. The programme was concluded with Shantimantra. On the occasion of Man.Eknathji Ranade’s birth anniversary our vidyalaya aptly sought to carry out. Annual Sports Day Programme. The dates arranged were 19th and 20th of November 2018. The District level participant Rajendra of VII std, carried the flame and passed it to other sports participants. The day began with a great show of enthusiasm and alacrity on the part of not only the students but also the teachers. Relay, Running, Ball in the bucket, Kho – kho , Kabaddi, Volley ball etc games were conducted with great efficiency. Lunch on 20th November was arranged by the school. The student performed to the best of their capacity and accepted the umpire’s decision without any rancour.